TOTEM - CIRQUE DU SOLEIL is rated 5.0 out of 5 by 1. Sorry there are no shows for Totem - Cirque Du Soleil right now. Cirque du Soleil returns to the Royal Albert Hall with Totem. Totem takes you on a stunning journey into the Evolution of Mankind - from our original amphibian state to our ultimate quest for flight. Alternating between primitive and modern myths, and peppered with aboriginal stories of creation, Totem explores the evolutionary process of species, our ongoing search for balance, and the curiosity that propels us ever further, faster, and higher? Featuring Cirque du Soleil's mind-blowing signature acts, and returning to London after record-breaking previous seasons, Totem is an unforgettable spectacle for all ages. 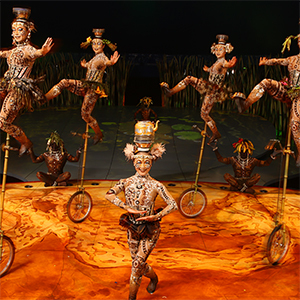 Experience the spectacular, world famous Cirque du Soleil at an iconic London venue - book now. AGE RESTRICTION: Children over 3 must have their own seat. Parents may bring under 3s along if they feel the event is suitable for them. Rated 5 out of 5 by wendito from Cirque du Soleil - Totem - Wish I could go again Wow! They were AMAZING. The show was so well presented and you were riveted from start to finish. There were many jaw-dropping moments and great humour. The set, costumes, mechanics and musicians all added to the atmosphere. But the artists were top of their game. If you get a chance to Cirque du Soleil don't miss it.